The first home video release of Don Coscarelli's classic and amongst the first horror titles available on video in North America. Unsure where it fell in order, but it appears only Blood of the Vampire (1958), The Omen (1976), Night Watch (1973), Welcome to Arrow Beach (1974), and Alien (1979) either preceded this one or were released the same year in Magnetic Video's horror catalog. The pioneering studio debuted The Fog (1980) and Carrie (1976) (scan here) on video the following year. Very rare to find this release in such great condition. For ID reasons in the first few years of their existence, Magnetic Video burned "MAG1" on the backside of all their cassettes. Also a sliver of the bottom of the cassette visible is "natural"; all of their early releases seem to exhibit this. 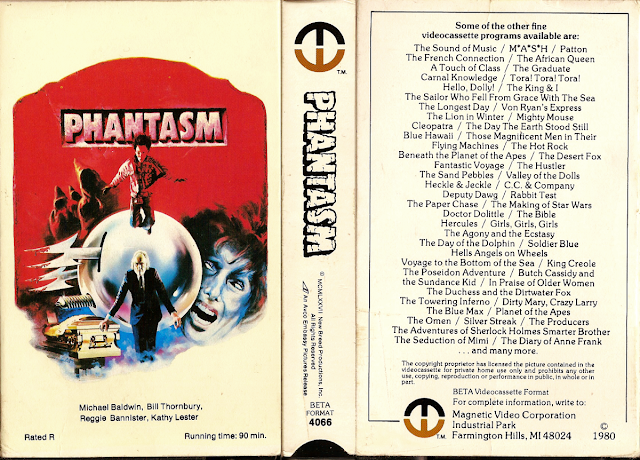 That's terrific - I remember renting my first movies in Beta from a TV/stereo repair store - had to give them a check from my parents for $50 to hold while I had the movie at home - the first three movies I rented from there - one at a time of course - Halloween, Laserblast, and Xanadu. Thanks for posting this!